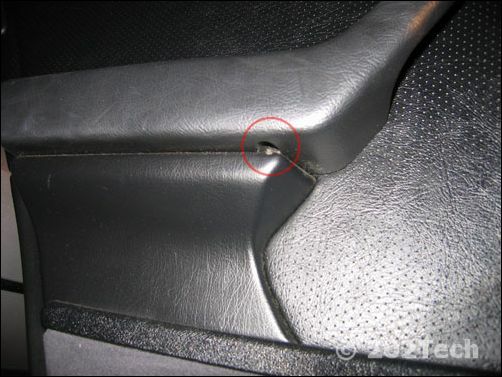 NOTE: This repair was done on my 1994 C280. However it may work for other years/models. I cannot guarantee 100% accuracy nor can I be liable for any damage one can cause to his or her car or self. 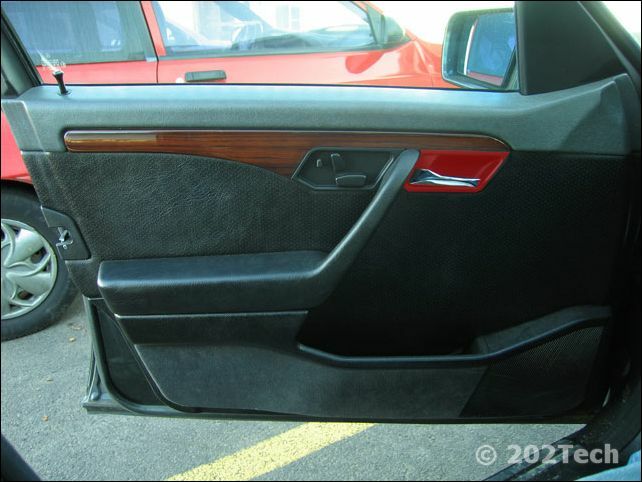 1994-1997 C-Class Mercedes had this type of door. 1998 and up had a little different style, so I can't gurantee anything, but it should be a similar process. Step 1: Unscrew the door lock knob. 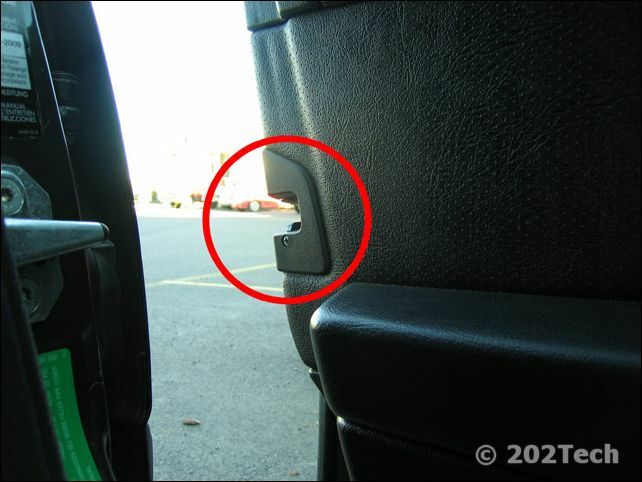 Step 2: Unscrew the the latch cover panel as circled in the picture below, then slide down with it to remove. 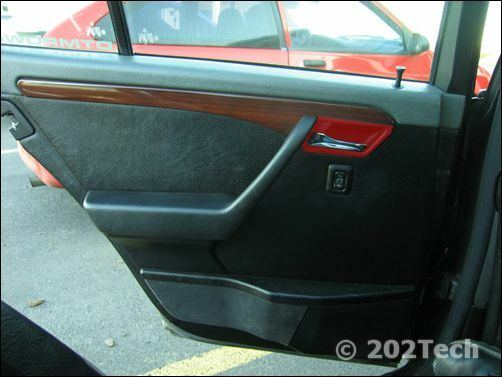 Step 3: Pull out the plastic door handle recess as highlighted in picture below door handle. 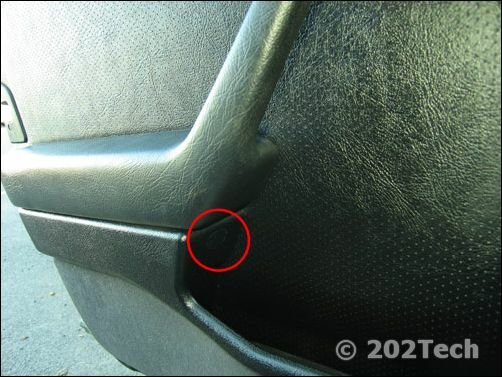 If the vehicle is equipped with side airbags, pop off the SRS badge on the door panel and remove the screw underneath it. Step 4: Unscrew the screw located behind the door handle recess in the door handle mechanism. Step 6: Begin popping off the door panel starting from the bottom. It is best to use a long screw driver or a wedge of some sort to avoid breaking the clips/panel parts. The next picture shows the approximate locations of each of the door clips behind the door panel. Step 7: Once the door clips are free, lift upward on the door panel to unclip it from the top of the door, and then pull out to free it from the door. Step 9: Unplug the electrical wiring harness from the power seat switch (if equipped). Step 1: Unscrew rear door lock knob. 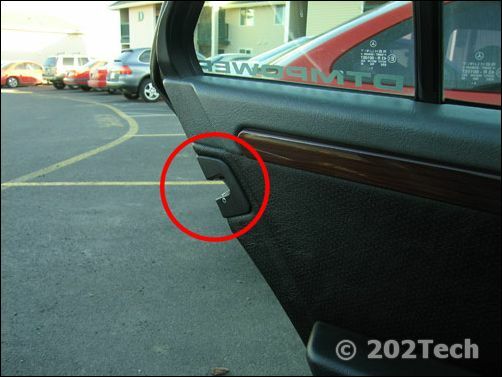 Step 3: Pry off the inner door latch cover as highlighted in the picture below and unscrew the screw behind it. Step 4: Remove screw in bottom of arm rest. The location is circled in the picture below. Use a #2 Philips screwdrive to remove. Step 5: Begin popping off the door panel starting from the bottom. It is best to use a long screw driver or a wedge of some sort to avoid breaking the clips/panel parts. The next picture shows the approximate locations of each of the door clips behind the door panel. Step 6: Once the door clips are free, lift the panel straight up to remove it from the top rail of the door, and pull away from the door. Step 7: Open the door latch cable retainer and lift door latch cable out of the door latch handle.